About Bird and Pigeons: Birds, pigeons in particular, like to roost in attics and on buildings in urban areas. They create a mess and a health risk with their nesting material and droppings. We are experts at pigeon and bird control and removal from private homes and properties. 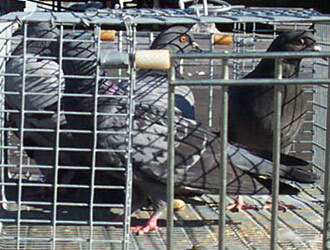 We excel at both Arlington pigeon and bird trapping and prevention. We are not a pigeon and bird exterminator company, but we use techniques such as humane live trapping, prevention, and exclusion to solve your Arlington / Fort Worth pigeon and bird problem permanently. We boast a 98% success rate, the highest in the industry, and are voted the Arlington / Fort Worth area's top wildlife animal control company. Give us a call at 817-717-3606 and we will take care of your pigeon and bird issue for good. About Us: All Animal Control in Arlington and Fort Worth TX is a full-service, licensed and insured nuisance wildlife control company. We solve conflicts between people and Texas' wildlife. We are considered the best wildlife control company in the Dallas area, and our rates are not only competitive, but well below the average for the area. We are a small, owner-operated company, and we don't have the overhead of the big companies. Also, unlike the larger companies, we do our own work (not some underpaid and careless employee) and we take great pride in our work. Give us a call to discuss your Arlington pigeon and bird removal project, and we will give you a price quote on the phone, and schedule a same-day or next day appointment at your convenience. Hello i found your website online after my husband was doing some outdoor yard work and knocked down a birds nest and didn't know that there were 2 babies in it. So we put the nest back in a tree but i am worried that the mom wont come back. We weren't able to put it back in the same spot since it was on a light fixture attached to the house. What would you suggest we do?